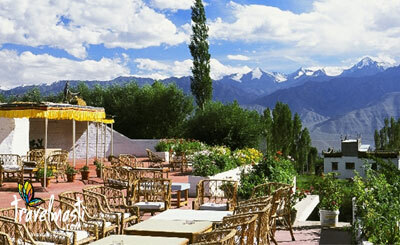 Hotel Omasila will make your stay a pleasure in the unique Himalayan Kingdom. Leaving behind the city pace, you can unwind yourself in the clean, fresh air. Situated at a very scenic spot, it is only a 15 min. drive from leh airport and a few minutes away from the market, Hotel Omasila gives a panoramic view of the Himalayan range. You will experience a feeling of tranquillity while relaxing in the elegant gardens of the hotel . Vegetable Garden: Omasila prides in having the most natural kitchen where the food is prepared from hygienic and pesticide free organic vegetables, which are planted in the hotel backyard. All the food is prepared by the master chefs who are well honed in the art of cooking. The Terrace View at Omasila: You can laze around on the Lawn or you can spend hours looking at the majestic Himalayan peaks. Natural beauty abounds in this lovely place and you will never get tired of the beautiful scenery all around you. Just open a window of your room and a whiff of fresh air welcomes you to the roof of the world. you’ll get spectacular view of the snow clad mountains from the hotel windows. At just 15 minutes drive from Leh airport and 2 minutes drive form main market,bank & post office, in the capital of Ladakh, “Hotel Omasila” will make your stay a pleasure in the unique Himalyan Kingdom. If you have not decided yet or wants to customize tour itinerary or hotels listed above in "Hotel Omasila, Ladakh Package with Bindass Holiday @2450/-", then we can change the travel itinerary and make a personalized, tailor-made holiday package, especially for you. We can modify this travel package as per your itinerary, budget, duration and the tourist places you would like to visit, including transportation and airfare should be included or not. Please fill the form below to contact us.